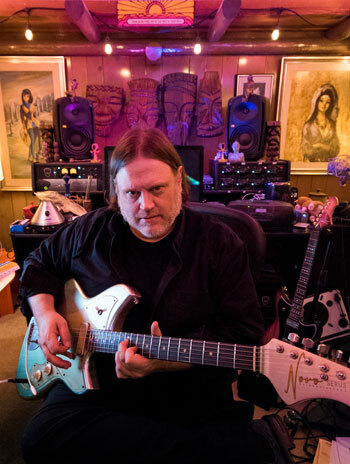 Matthew Sweet started out making music in his hometown of Lincoln, Nebraska. Moving to Athens for college, he fell in with the vibrant music scene there, playing with Oh-OK and The Buzz of Delight. After scoring a record deal with Columbia (and then with A&M), Sweet released a pair of albums (1986’s Inside and 1989’s Earth), neither of which caught on with the record-buying public. But everything changed with the making of 1991’s Girlfriend. Rightly considered a landmark album of its era, Girlfriend effectively combined the many dimensions of Sweet’s songwriting – with elements of power pop, classic rock, psychedelia, country and western and punk – into a seamless whole. Aided in his pursuits by a top-notch musician ensemble that included Robert Quine (Richard Hell and the Voidoids), Richard Lloyd (Television), Lloyd Cole, and others, Sweet also brought to the sessions his best songwriting yet. Tracks like “I’ve Been Waiting,” “Evangeline” and “I Wanted to Tell You” helped define the Matthew Sweet sound. Sweet’s career took off in the wake of Girlfriend, and – relocating to New York City and then to Los Angeles – he would go on to release a string of high-quality albums. But as tastes changed – grunge was taking hold in the commercial marketplace just as the ear candy of Girlfriend hit the airwaves – Sweet settled into a kind of cult status. Despite the irresistible charms of his songwriting, playing and arrangements, Matthew Sweet would not enjoy widespread commercial success once the 1990s ended. Thankfully for his ardent fans, he has remained busy, touring and recording new material. In 2013 he left L.A., returning to his home state and settling in Omaha. After a lengthy gestation, his twelfth solo album (not counting three all-covers collaborative albums he’s made with Bangles’ Susanna Hoffs), Tomorrow Forever was released June 16. The product of a successful Kickstarter campaign, Tomorrow Forever was created and released without the involvement of a traditional record company. For people who insist upon classifying an artist’s music into a single genre, Sweet’s catalog is potentially frustrating. Over the years, various critics have neatly defined every one of Sweet’s albums with a genre label. By their measure, 100% Fun from 1995 is alt-rock, Blue Sky on Mars (1997) is new wave, and 1999’s In Reverse is psychedelic. It’s enough to confuse – and potentially ward off – someone unfamiliar with his music. “I think that probably some of it is from me doing so many interviews about albums over the years,” Sweet says. When interviewers ask, “What’s up with this album?” he says that he might respond, “’It’s more psychedelic.’ So I sort of feed into that.” But his music doesn’t veer all over the stylistic map, like, say Neil Young or Todd Rundgren. “When you are one person, you can’t really not be yourself,” he chuckles. For past albums projects, Sweet would often write as many as thirty songs, recording demos for each. Then he’d begin the process of winnowing the selections down to an album’s worth of songs, and record them properly. And though he originally planned to streamline his working methods for Tomorrow Forever, in the end Sweet amassed a large cache of finished studio material. “I really tried to be extra ambitious about getting good stuff, so I ended up doing three album-length batches of songs,” he says. He spent the better part of last fall and winter selecting the songs for the album. And while the Kickstarter campaign promoted a disc of demos as one of the available premiums for those helping fund the project, things worked out a bit differently in the end. “Since I didn’t really make a lot of notable demos, that’s going to become an album of outtakes,” Sweet says. There’s a freedom that comes with not being on a major label, Sweet believes. In the old days, he often felt an implicit – if not direct – pressure. He says the clear message was, “’Why can’t you be a thing that will sell?’ And even if you are doing well, it was like, ‘Why can’t you be a thing that will sell even better?’” That frustrated Sweet, who says that he wouldn’t have known how to make music that was more commercial in any event.